Imagine if Timbaland were kidnapped and held hostage in a council flat in Tottenham. Imagine then, that elite robot agents aligned to the New World Order were sent into rescue him with laser cannons little knowing that the kidnappers were in fact an underground cell of benefit-cheat Jedi. Imagine hip hop recapturing the sheer brutality of classic-era Public Enemy without it becoming a retread. Imagine if "urban" music was made not for the charts but the heart. Imagine "Two Fingers". 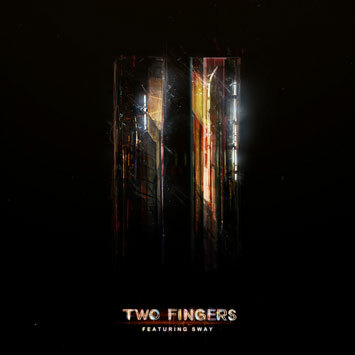 Two Fingers are Brazilian beat-adventurer Amon Tobin and Joe "Doubleclick" Chapman. The pair met when Tobin lived in Brighton and bonded over an interest in music that ran way beyond the boundaries of "electronica". In Montreal they applied production techniques associated with UK styles like drum & bass to the template of hip hop. Imagine if Timbaland were kidnapped and held hostage in a council flat in Tottenham. Imagine then, that elite robot agents aligned to the New World Order were sent into rescue him with laser cannons little knowing that the kidnappers were in fact an underground cell of benefit-cheat Jedi. Imagine hip hop recapturing the sheer brutality of classic-era Public Enemy without it becoming a retread. Imagine if "urban" music was made not for the charts but the heart. Imagine "Two Fingers". Two Fingers are Brazilian beat-adventurer Amon Tobin and Joe "Doubleclick" Chapman. The pair met when Tobin lived in Brighton and bonded over an interest in music that ran way beyond the boundaries of "electronica". In Montreal they applied production techniques associated with UK styles like drum & bass to the template of hip hop. It was an experiment with explosive results. MOBO-winner Sway (now signed to Akon's Konvict label in the US) heard what was brewing he was so taken with it, he flew straight out to Montreal and recorded seven tracks with them, showing a harsher, more serious side to his personality whilst offering wry social commentary on everything from the way young Black men are treated ("What You Know") to crazy girls who do too many pills ("That Girl"). The remaining rhythms were voiced by sometime Missy protégé Ms Jade and dancehall legend Ce'Cile. A couple of instrumental rhythms were added and this, first stage of a continuing project, was complete. "Two Fingers" is a project unlike anything that any of the three main players has ever made before, a unique, utterly uncompromising, brutal and beautiful record that could only have grown out of the UK and the internationalism of those involved. If it's not hip hop as we know it, then nor is it drum & bass or grime. Like all the best music it transcends genre to stand on its own – icy, transcendent, brilliant.